SILICON SLOPES, UT--(Marketwired - February 18, 2016) - Domo today announced that Eric Varvel, Chairman of Emerging Markets and Sovereign Wealth Funds for Credit Suisse, will speak on the mainstage at Domopalooza™ 2016 in a fireside chat with Josh James, Domo founder and CEO. 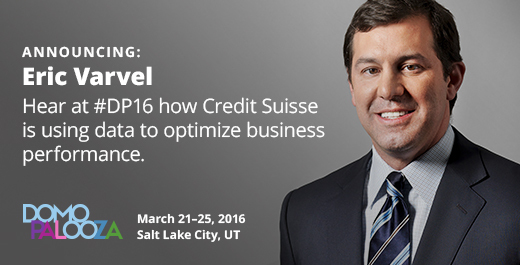 Varvel will discuss how his organization is leveraging data and Domo to optimize the investment bank's business origination efforts. Varvel joins a lineup of inspiring speakers, including NBA Hall of Fame athlete and entrepreneur, Earvin "Magic" Johnson, as well as General Stanley McChrystal, best-selling author and former commander of the nation's premier military counter-terrorism force, Joint Special Operations Command (JSOC). All will share their insights on leveraging data to make decisions to improve organizational performance. More mainstage speakers will be announced soon. To learn more about how experts from Credit Suisse and other successful organizations are using Domo to get more value from their business data, register for Domopalooza on Domopalooza's event page.